What is a kubaton keychain? The Kubaton, also miswritten as (kobotan,kobatan,kubitan) is a tool for a self-defense used as keychain weapon and was developed by Takayuki Kubota in the 1960s. It is typically 14 centimetres long and and about 1 cm in diameter. The material is usually of a hard high-impact such as steel or wood and can take many shapes. What is kubaton best used for? The kubaton is used as a force maximizer in self defense situations to target bony, fleshy and hypersensitive areas in your opponents body. The force and the technique used with the kubaton need to match the criticality of the situation. It’s actually a very flexible and versatile tools that can be used in different ways like hitting, control, hardening, etc to control a situation. How can I learn to use a kubaton? The basics of using the kubaton can be learned in one hour and a full course can take from 3 hours to few sessions depending on the techniques you are learning. But it’s like everything else, it comes with practice and repetition. In a real fight you will not have much time to think about what to do next so the moves need to be natural and intuitive. In short you need to practice. Is it legal to carry a kubaton around? Generally speaking the kubaton is legal to carry as long as you use it as a keychain or for some other legitimate purpose in most of the globe. It’s not a lethal weapon, although it can be used as such when needed. 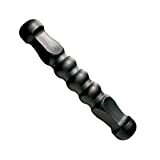 There are also other forms of the kubaton which are normal to carry as everyday things like the a tactical pen. But always review your state laws as these change from one place to another. Can I take it while traveling on airplanes? 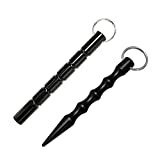 I personally have had the keychain with the kubaton several times in my cabin luggage and it was allowed on the plane. But this is probably not the case on different airports. Where to buy one and how much does it cost? You can buy one online from Amazon or eBay. There are many shapes and colors so you need to pick one which you would feel comfortable carrying around most of the time. They can cost as low as $8 and up to $20 depending on the material it is made of and the design. How to pick my kubaton? There are some factors to consider when you pick your kubaton, some of them are that you need to like it’s design and shape as you will be carrying this around with you most of the time, so you it will need to match your personal taste. The second important factor is going to be the legal considerations, you will have to confirm that your kubaton conforms the laws in your state. Another factor that you need to consider is the grip, it has to be solid in your hand, you don’t want to easily lose your kubaton in a street fight. In my opinion the material doesn’t really matter as long as it’s solid enough and satisfies the other needs. Can I learn kubaton at home? There are many online courses and DVDs which can show you different techniques for using the kubaton, but it’s always better to train with a live instructor and partner so you can get the real feeling or different aspects of the technique. But this is not an excuse not to learn, if you still can’t find an instructor or a partner near you, you can still practice various techniques on your own. How to practice kubaton techniques without a partner? There are many online resources to teach you drills and techniques that you can practice all by yourself. Check our media libarary for some of them. In the online shop, we would be listing some of the best DVDs available that can teach you the basics of using the kubaton at your own pace.